At CU Maurice River’s next bimonthly meeting Lorraine Kiefer will present Gardening Naturally with Native Plants; she will discuss woodland plants, pollinator plants, and some vegetables that although southern in origin are natives nonetheless. Over the years, Lorraine has made a name for herself in the gardening world as an educator, writer, floral designer, and professional horticulturist. She and her husband Ted are the owners of Triple Oaks Nursery & Herb Garden in Franklinville, NJ, which was established in the mid 1970’s. She teaches several classes a year at her nursery through Gloucester County College. Lorraine also gives environmental classes, including a series that was funded by New Jersey Department of Environmental Protection entitled Backyard Best Management Practices and Wildlife Habitat Project. Gloucester County Parks sponsored these talks in cooperation with The Federation of Gloucester County Watersheds. 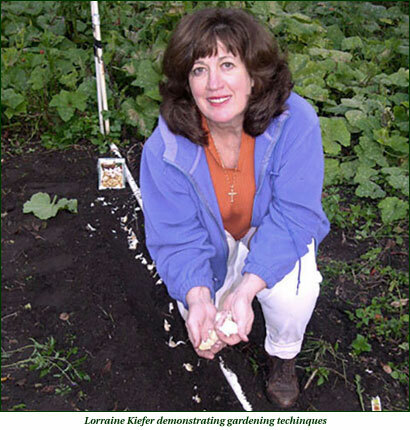 Lorraine is also is a co-author of Best Garden Plants for New Jersey with Alison Beck. The founder and co-chairman of the South Jersey Unit of the Herb Society of America, Lorraine serves on the Horticulture committee of the National Herb Garden in Washington DC and has written a chapter in the Brooklyn Botanical Garden’s book on fragrant plants. She also writes for the Herb Society of America’s Herbalist. In June 2017, Lorraine will be the recipient of the Herb Society of America’s Helen De Conway Little Medal of Honor, awarded to a member who has made outstanding contributions to the society or to the world of horticulture in general. Lorraine attended West Chester University and State University of New York at New Paltz. She graduated from Rowan University with degrees in English and Biological Science and subsequently pursued graduate courses in Environmental Education. She has studied floral design and horticulture throughout the years. Addition – Reading Circle led by Suzy Merighi on Joanna Burger’s book, 25 Nature Spectacles of New Jersey, Tuesday, May 2nd at 6:30 p.m. at Andrea’s Trattoria. Sights and Sounds of the Pinelands on April 27th has been cancelled. We are currently looking for a new presenter. Please keep the date on your calendar. Additions to WheatonArts Eco Fair – Saturday, May 6th, 2017 – See below. 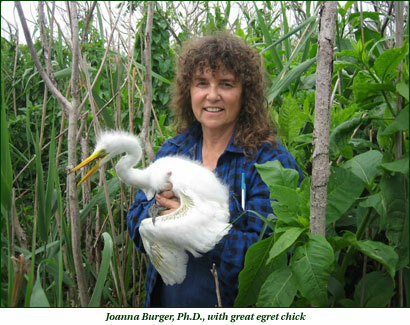 Begin reading now for our Reading Circle – Once again leading up to our guest speaker at the WheatonArts Eco Fair, we will be reading a book written by presenter Joanna Burger Ph.D., an internationally-known behavioral ecologist and NJ’s most published ecologist. 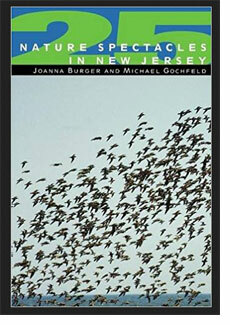 Co-authored by her husband Michael Gochfeld, the book is entitled 25 Nature Spectacles in New Jersey. Suzanne Merighi will lead the CU Maurice River Book Circle at Andrea’s Trattoria in Millville on Tuesday, May 2nd at 6:30p.m., where we will discuss the marvelous natural displays to be seen in the Garden State. Used copies of 25 Nature Spectacles in New Jersey are available at our office for $10 – $16 (prices have varied), or order through AmazonSmile.com and choose Citizens United to Protect the Maurice River and Its Tributaries, Inc. as your nonprofit of choice. WheatonArts will have copies in the near future as well. The day begins 10 a.m. – This is a great experience that you won’t want to miss. At the event many folks pick up their spring plantings from the master gardeners and local greenhouses. As always there will be a CU booth including some activities for adults and children. 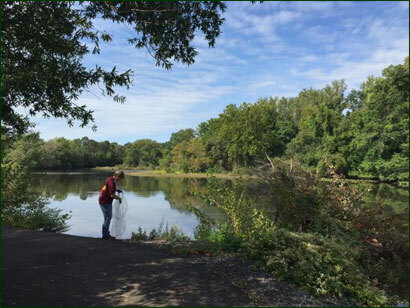 CU Maurice River is hosting the ribbon cutting and guided walks on the new Nature Trail in conjunction with WheatonArts and Joanna Burger of Rutgers University. Trail Inauguration, Ribbon Cutting, and First Trail Walk starting at 11:30 a.m.
Joanna Burger Book Signing and Presentation at 1:30 p.m. and 2 p.m.
Second Trail Walk at 3:15 p.m.
Joanna Burger has spent over 40 years studying the plants and animals in New Jersey, concentrating on the Jersey shore, Delaware Bay, and the Pinelands. These three ecosystems are intertwined to form the heart of our region. Her topic will be “25 Nature Spectacles of South Jersey.” Some amazing natural phenomena occur in our state. Dr. Joanna Burger will take you through the seasons, looking in on the scenes that pass before our eyes each year. These include Mountain Laurels, Bog Orchids, and the choruses of frogs. We’ll see masses of Horseshoe Crabs that fill Delaware Bay beaches in May, along with the thousands of migrant shorebirds that feast on their superabundant eggs. Other sights include nesting colonies of Black Skimmers on beaches and Night Herons in coastal forests. In autumn we have the migration of the Monarch Butterflies en route to the Mexican mountain forests, and the arrival of Snow Geese and Tundra Swans from the Arctic. These and other natural displays intertwine and depend on each other, weaving an exciting ecosystem that is uniquely South Jersey. Dr. Joanna Burger, a Distinguished Professor of Biology at Rutgers University in New Brunswick, has conducted research from Antarctica to the Arctic, on subjects from crabs to sea turtles, fish, birds, and mammals, often involving local stakeholders and Native Americans. She has served on several national and international committees including the National Academy of Sciences (National Research Council), U.S. Fish & Wildlife Service, Environmental Protection Agency, National Oceanographic and Atmospheric Administration. She is a Fellow of the International Ornithologist’s Union, the American Ornithologist’s Union, The International Union for Pure and Applied Chemistry, and the American Association for the Advancement of Science. 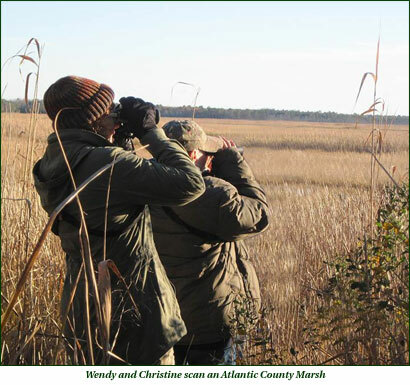 She received the prestigious Brewster Medal from the American Ornithologists Union, the Distinguished Achievement Award from the Society of Risk Analysis, as well as Conservation Awards from New Jersey Audubon, the Delaware Valley Ornithological Society, and the International Waterbird Society. She has published over 600 papers in refereed journals, and many books, including The Parrot Who Owns Me (Random House), 25 Nature Spectacles in New Jersey, A Naturalist Along the Jersey Shore, and Life Along the Delaware Bay (Rutgers University). Come with us to Ecuador! We have a number of folks signed up to go to Ecuador this November, beginning on the 11th and ending on the 19th. Some people are even doing the pre-trip called Tinalandia on 7th -12th. We will be exploring the Northwestern Andean Slopes. When you contact him, just tell Victor Emanuel that you are with the CU Maurice River group. In fact, you can sign up for any VENT tour and tell them CU Maurice River sent you and CU will get a donation toward our mission. Presently we have about 8 sign-ups. Jane Galetto comments, “Victor Emanuel gives a terrific mix of excellent naturalists, fascinating cultural insights, and the best accommodations available for your region. So you learn and have fun in great style. 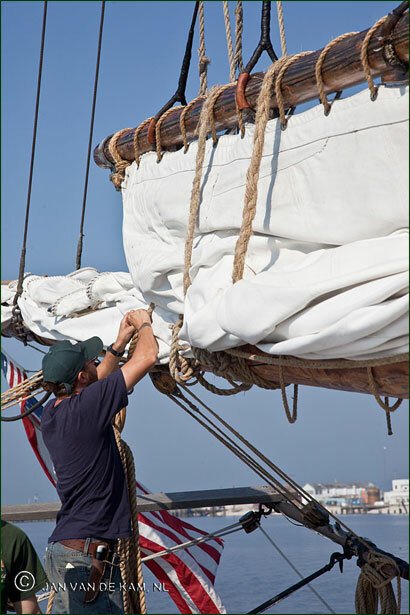 I hope you will join me and my husband on this fantastic trip.” Feel free to email Jane Morton Galetto if you are interested in traveling with our crew. We thank Mark Garland for his presentation at Winfield’s February 9th on the birds of Ecuador, and for giving us a preview of our travels. 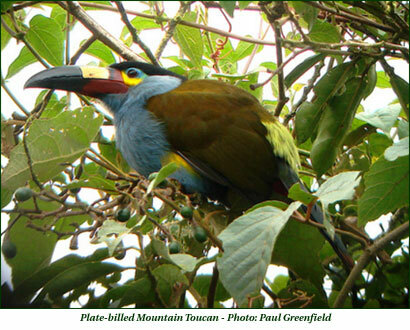 Famed ornithologist Paul Greenfield will be one of the trip leaders. Paul grew up near New York City and became interested in birds as a child. He received his B.F.A. from Temple University where he was an art major at the Tyler School of Art. Since 1972 he has lived in Ecuador, where his fascination for birds and art has culminated in the completion of his 20 years of work illustrating the book he co-authored with Robert Ridgely, The Birds of Ecuador. Paul is committed to saving Ecuador’s avian diversity and important habitats through his involvement with various foundations, as well as working with local government and communities to encourage their investment in the protection of “their” biodiversity and the promotion of birding tourism in Ecuador. He has been showing visitors the birds of this fascinating country for over two decades and has led many Ecuador bird tours. He and his wife, Martha, live in Quito. Led by Wendy Walker, Christine Brown, and/or Karla along the Maurice River Walking & Bicycle Trail. Meet at the CU Maurice River office at 10:15 a.m. and then join the Holly City Family Success Center’s members at their office. Once we are all gathered we will venture off on a nature walk exploring the natural and cultural resources on this urban trail. Dates are April 26, May 31, June 21, July 26, September 27 and October 25. There is no need to sign up; you can just show up. Use our new park check-lists for each of the walks and let’s see how many critters we can spot! Tuesday, March 28th – We plan to explore the Nature Conservancy’s Maurice River Bluff Preserve in hopes of seeing some spring migrants. We will meet at Waltman Park off Brandriff at 9:00 a.m. in Millville and carpool from there. Suggested are binoculars and hiking boots. Pack a picnic lunch. Tuesday, April 18th – Depart 8 a.m. from Waltman Park. We will venture on our farthest field trip (1hr. 45 min) to Maryland’s Susquehanna State Park. 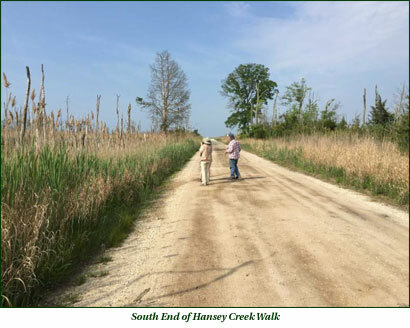 There we will meet one of CU’s southernmost members, Diane Jones, along with local flora and avian experts to see the spring ephemeral plants, migrating shad, and eagles and great blue herons galore. If the ephemeral plants cooperate it will be spectacular. Likely are blue bells, Dutchman’s britches, trout lily, trillium, marsh marigolds, squirrel corn, and others. We will eat a late lunch in Havre de Grace. Advance registration is a must so that we can properly arrange drivers and lunch reservations. Dress in layers, rain gear, dry set of clothes if raining, binoculars, cameras, close-up lenses, flora books, etc. As noted, RSVPs are required for planning purposes. Tuesday, May 23rd – Shorebird Time. Meet at Waltman Park 9 a.m. and caravan to Heislerville Wildlife Management Area and onward to other nearby environs. March 18th (meet at CU Maurice River office 9 a.m.) – Cumberland County Trash Hunt. 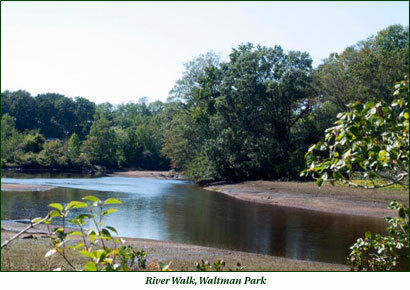 CU Maurice River volunteers to lead the clean-up efforts at Waltman Park in Millville, NJ. April 8th (meet at CU Maurice River office 9 a.m.) – Join us for a walk at Belleplain State Forest to see what wildlife we can spot at the onset of spring. May 20th Hansey Creek Walk with World Series of Birding Team (meet at Hansey Creek Road 9 a.m.) – See Ah Why Knot below. June 24th – See Garden Tour below. RSVP necessary. The day begins with a paddle on the Menatico at 9 a.m. followed by the new members’ orientation at the Russells’ home on the Maurice River at 5 p.m. Next is an ALL Members Campfire & Potluck at 6:30. The campfire offers new members a chance to meet existing members. Bring your campfire chair, musical instrument(s), and dress in layers. 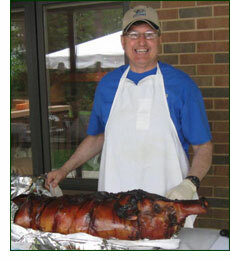 Contact Doreen Homan with your reservations for one or all three events. Doreen.Homan@CUMauriceRiver.org or call 856-300-5331. 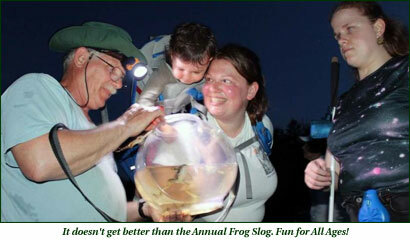 Friday May 12th 7:30 p.m. to 9 p.m. is the Most Family Fun Evening of All – The Annual Frog Slog with Fred Akers. Discover the secret life of frogs on this night excursion. Learn to identify frogs by their breeding songs and more. Come with a flashlight and be prepared for wet, frog-sloggy conditions – knee-high mud boots or higher preferred. Free and open to all ages. KIDS LOVE THIS EVENT! Touch tanks available! We might be trying a new location this year so calling in will be imperative. The 2017 Ah Why Knot Awards with special guests, the International Shorebird Recovery Team, and of course the PIG ROAST – A HUGE DAY of fun! Great for families too! May 20th is the big event! All members and volunteers are invited to attend the annual Pig Roast and Pot Luck with the shorebird team, where we will also present our Ah Why Knot Awards for the year. This is a great celebration at the Galetto residence, and we want you to come! Please RSVP to Doreen and let us know if you would like to bring an appetizer, side dish, or dessert. Additional entrees, especially vegetarian options, are also especially appreciated. Folks are welcome to arrive starting at 2:00 p.m. for a paddle or some time outdoors, and volunteers are also welcome to arrive at 2:00 p.m. to help with set-up. Please let Doreen.Homan@CUMauriceRiver.org know if you can help with set-up and/or cleanup. Dinner will take place around 5 p.m. In the morning of May 20th we will also hold our Annual Walk at Hansey Creek Road in Commercial Township. Join World Series of Birding Fish Hawks team members Tony Klock and Mary Watkins for a great guided walk. Who knows – possibly other 2017 team members like Karen Williams or Clay Sutton might make guest appearances. Past team members are welcome to help as well. The walk begins at 7:30 a.m. in an effort to hear spring migrants sing. Tony is likely to show up even earlier than that; one never knows. The road tends to have great attributes, little to no traffic, wonderful birds and, being on the macadam, fewer ticks. We will paddle Turkey Point at 10 a.m. to witness the phenomenal scenic value of the wetlands landscape and the bountiful wildlife that inhabits the Delaware Estuary. Be on the watch for more information in CU Maurice River emails. Please register in advance. Kick off your summer on May 29th on the A.J. Meerwald’s Memorial Day Birding Sail. CU Maurice River helps fill the boat on this special day, and our members receive a discount on the cost of the ticket. Call the Bayshore Center at Bivalve to make your reservations: 856-785-2060 (tell them you are with CU Maurice River). What better way to start the season than with your CU friends! 8:00 a.m. to noon. 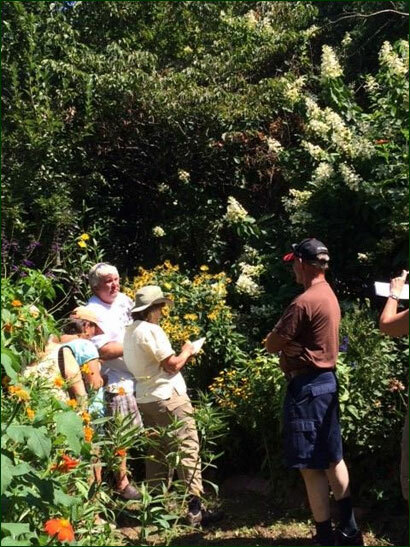 Join Tony Klock and Karla Rossini for a special Cumberland County Garden Tour. Starting June 24th at 9 a.m. we will carpool to different native and wildlife gardens in the Maurice River Watershed. The tour will conclude at Triple Oaks Nursery, where Lorraine Kiefer will meet us with some native plant desserts and refreshments and then walk us through her gardens. Afterwards you can use the opportunity to look around Lorraine’s nursery and purchase a new native plant or two to bring home. Sign up. TREES, TREES, TREES! We will be giving them away to property owners who would like to reforest a portion of their property, stabilize stream banks, encourage better water absorption, or engage in other best-management practice using native trees. They are free but photo documentation is necessary. Sign up for bare-root trees and bushes while they last. Available are redbud, flowering dogwood, buttonbush, eastern white cedar, and arrowwood bare-root saplings. For further details contact Karla.Rossini@CUMauriceRiver.org (also see Volunteers necessary for April 1st). 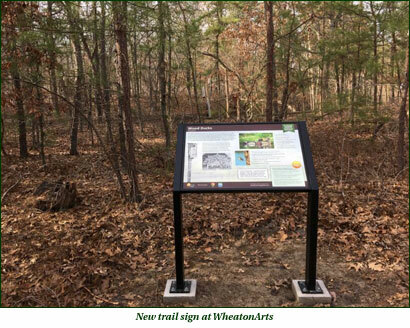 Two trail workdays at WheatonArts: March 15th and April 25th. On the 15th we will be spreading some stone; on April 25th we anticipate some trimming and a trash pickup around the grounds so that things will look nice for the Eco Fair on May 6th. If you want to help with habitat projects please contact the office. Doreen is keeping track of volunteer names for crew leaders Doreen.Homan@CUMauriceRiver.org or call 856-300-5331. 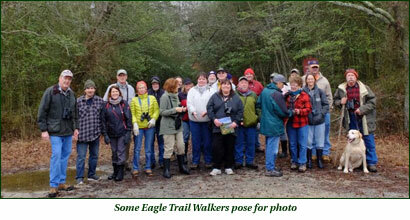 The January 21st Eagle Trail Walk remained one of our most popular; over 30 hikers enjoyed a lovely brisk day. At one point more than 20 eagles were in view at once! Afterward half our group filled the porch at Newport Landing Restaurant and had a fun time discussing our many great sightings. Special thanks to leaders Tony Klock, Mary Watkins, Christine Brown, Sue Fenili, and Jane Morton Galetto. Some of our female members were attending the Women’s March in DC that day. Among our ranks we had one placarded sympathizer, Wendy Walker, whose sign covered all the bases. Jane gave two presentations in February and March, on turtles at the Bayshore Center in Bivalve and on vultures for the Gloucester County Nature Club. On January 26th – the Volunteer Ambassador Training Party was attended by enthusiastic members. We look forward to working with these folks throughout the coming years. This year’s 17th Annual Eagle Fest on February 4th was a success. The County did a great job of distributing information to various media outlets. It is estimated that 800-1000 were in attendance. The weather was clear and cold and the sun made for a pleasant day; all the guided walks were very popular. The presentations at the fire hall were clearly appreciated, with 75-150 people for each speaker. A special thank-you to Leslie Ficcaglia for organizing the speaker roster. New Jersey Audubon did a super job of staffing the stations; many of our crew are joint members/representatives. In addition we want to thank CU docents Bert Hixon, Mary Watkins, Karen Williams, Wendy Walker, and Karen and Brian Johnson. Kathy Michel and Tony Klock also covered the Bayshore Center at Bivalve. The Saturday February 18th walk/drive at Forsythe National Wildlife Refuge was a hit. Mary Watkins and Tony Klock led some 30 participants on a carpooled outing around the embankments. There they helped visitors to spot teals, canvasbacks, peregrine falcons, shovelers, pintails, buffleheads, egrets, herons, and many more avian species. Afterwards we shared our experiences from the day during a nice lunch at the Oyster Creek Inn Restaurant & Bar. On February 21 the Vineland Historic Society rolled out the red carpet for our Tuesday on the Fly. We thank them for hosting our attendees. AMAZING! March 4 – the 12th Annual Chili Bowl was quite an accomplishment. Thanks to over 100 people who donated auction items, prepared chili, participated in set-up, clean up, beverage service, and performed a million other necessary tasks, this year’s Chili Bowl was our most successful fundraiser to date! A special thanks to our dinner attendees, bidders, and sponsors. Over 275 folks purchased tickets. Karla Rossini attended the Annual Partnership for the Delaware Summit in Cape May, NJ on Jan 23, 24, and 25. Presentations were given on a wide variety of topics involving the health and future of the Delaware Estuary. Some of the presentations covered research on resiliency restoration projects, storm water infrastructure, litter accumulation in tidal zones, estuary habitat restoration projects, water quality, green city and clean waters planning, thin layer placement in coastal wetlands, and leveraging community partnerships to elevate non-profit success. 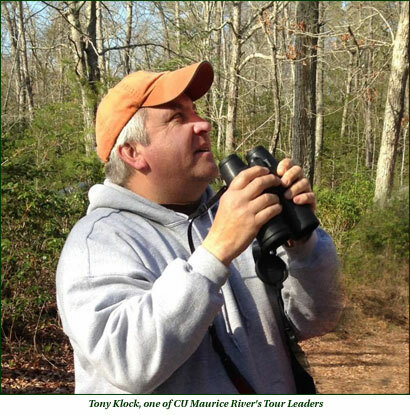 The CU Fish Hawks will be back in action in the World Series of Birding on Saturday, May 6th. This has become an extremely successful fundraiser for CU Maurice River. For 2017 the series will support avian work and programming; please consider a donation to the cause. Once again we have a super team: Clay Sutton, Tony Klock, Karen Williams, and Captain Mary Watkins. You can support them in one of three ways: 1) take a gamble and make a pledge per species, 2) send any flat dollar amount, and/or 3) help us find sponsors for the event! 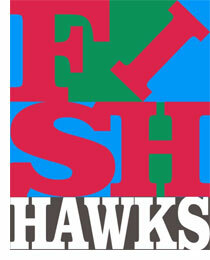 Our new CU Fish Hawks t-shirt design is a Pop Art classic and those who contribute $50 or more will receive one. We need not only donations but also volunteers who would like to help raise pledges. Go Fish Hawks! For more information email Jane Morton Galetto or call 856-300-5331. See TREES, TREES, TREES above on April 1st. Volunteers are necessary for tree plantings at three locations on April 1: WheatonArts, Cumberland Guidance Center, and a downtown garden, location to be determined. Community & Wildlife Serenity Garden in Downtown Millville. CU Maurice River is working with volunteers, schools, and other non-profits to install a wildlife garden in Millville’s downtown area. If you are interested in forming part of this team and making a difference for community and environmental health, please email Karla Rossini or call 856-300-5331. March 17th CU Maurice River will host the Riverfront Renaissance Center for the Arts’ show. We hope that many of our members will come out for the monthly opening. Please contact Doreen if you would like to be an ambassador for the event; email Doreen Homan or call 856-300-5331. Saturday, March 18th Walk and Clean-Up along Maurice River Bicycle and Walking Trail. Meet at CU Maurice River office at 9:00 a.m. for the clean-up, which should conclude by 1 p.m. Please wear protective gloves, and calf-high boots if you have them. The park abounds with wildlife. By participating in the park clean-up, you help the local environment and community health while enjoying a fulfilling outdoor experience. 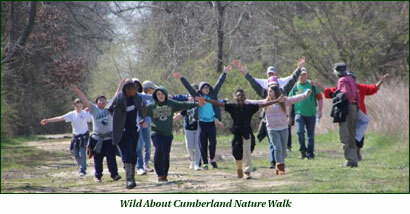 Wild About Cumberland – March 21st, 22nd. This year we will once again partner with the Bayshore Center at Bivalve, The Nature Conservancy, Woodford Cedar Run Wildlife Refuge, and PSEG to get Cumberland County 4th graders into the great out-of-doors. Teachers, students, and chaperones will be treated to a half-day outdoors on nearby trails with CU leaders and volunteers, and a half-day indoors at the Bivalve Center with sessions that emphasize “sense of place” and focus on local habitats and species. Special thanks to OceanFirst Bank for making Wild About Cumberland possible. Hosting the International Shorebird Recovery Team in May. 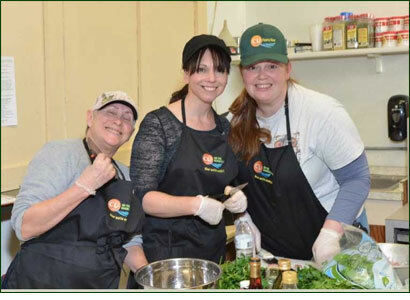 If you would like to provide a meal or be part of a cooking crew for the recovery team please contact Jane at forrivers@comcast.net or call her at 609-774-5853. She will be contacting past participants and/or their team captains. For those new to this undertaking, we have been feeding the scientists and their assistants for over 9 years. A team or over-energetic chef basically makes a meal for 25 to 30 folks. It is much easier than it sounds. It is buffet style and the scientists will lend a hand if necessary. You do not have to clean up or set tables (although everyone’s approach is different). It is an experience you won’t want to miss. If you are a newbie to the process we can connect you with a team to provide a side or dessert. 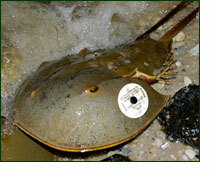 reTurn the Favor- Horseshoe crabs are a key player in the ecosystem of the NJ Delaware Bayshore, having existed for millions of years. Their spawn is critical to migrating shorebirds. Thousands of crabs each year are trapped by rubble, bulkheads, and other impediments. Last year our volunteers put in many hours helping save hundreds to thousands of crabs near East Point Light House. If you are an experienced volunteer and are interested in returning horseshoe crabs to the bay, please email Karla Rossini or call 856-300-5331. Karla will keep you posted on the particulars. If you are new to the program, make sure to sign up for the RTF training. It will be held at the Bayshore Center at Bivalve on April 29th at 10:00 a.m. Experienced volunteers can get the necessary permits at the CU Maurice River office. You can register for the training now. Two super days of camaraderie. We will need CU Ambassadors for both events. You won’t want to miss these fun-filled occasions! More details to follow in emails. To volunteer as a CU Ambassador email Doreen Homan or call 856-300-5331.